When we host a backyard party, it’s always for a crowd. 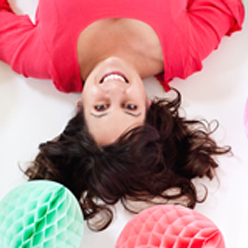 While I love throwing a good party, the finances of it all can spread us a little thin. So I’m always on the lookout for easy ways to entertain a crowd that are impressive but don’t put me in credit card debt. 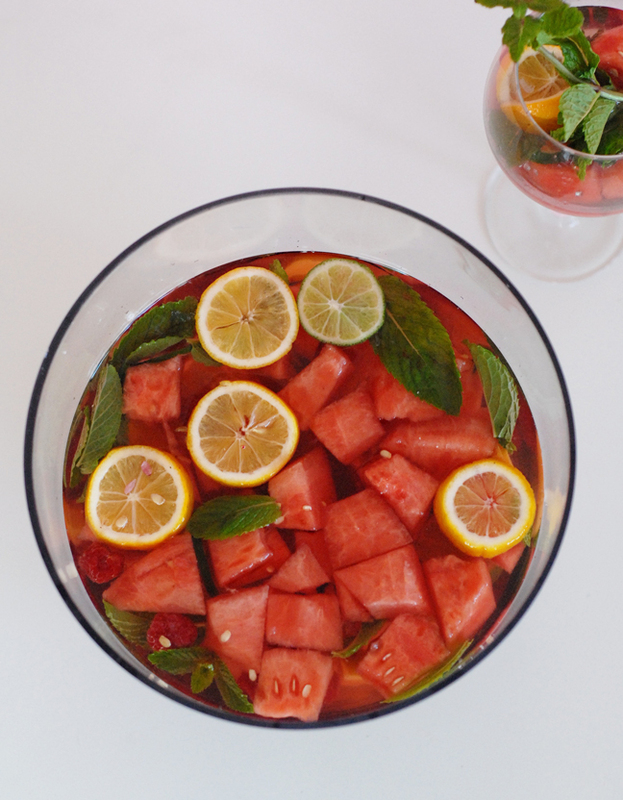 This watermelon rosé sangria checks all those boxes. 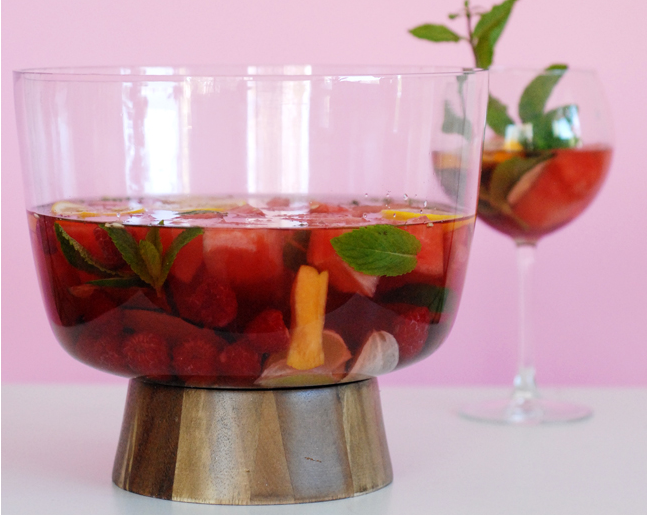 It combines in-season fruits and wine in a big punch bowl or drink dispenser, and looks just as impressive as it tastes. I’ve made it a few times and perfected the recipe. Who can say no to a cold glass of rose sangria in the summer? Step 1: In a large pitcher add wine, Grand Marnier, brandy, and agave nectar. Stir well. Step 2: Add in all fruit + mint sprigs and cover. 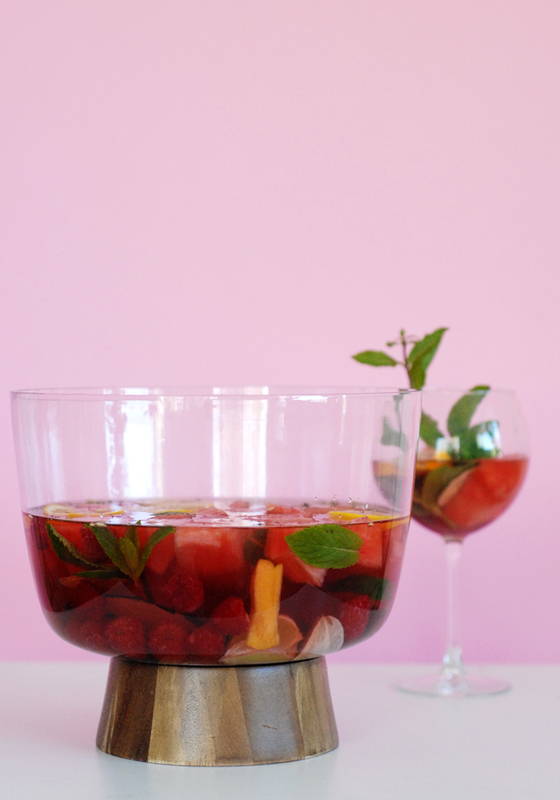 Allow the sangria to sit for at least 3 hours refrigerated before serving. Step 3: Remove mint sprigs. Step 4: Add ice, a fresh lemon slice, and a small mint sprig to each of the individual glasses, and serve from a large container for a party drink made easy. Victoria Hudgins is a mom to twins and the author of the popular blog A Subtle Revelry. She recently authored the book Materially Crafted and has two more coming soon. She's an avid craft lover and believes in throwing confetti just to make today special. She also believes in baking cakes just because they taste good (and because that cake stand is too damn pretty to be sitting in the cabinet)! She believes in enjoying revelry, daily. Follow along on Instagram or Pinterest and get a special surprise by emailing with Victoria.